Located just minutes from the UK Houses of Parliament (where the cacophony of MPs barking at one another fill the Westminster air), the wonderful St. John’s Smith Square provides discerning classical music fans with a chance to feast their ears on a wide programme of concerts, festivals and recitals. Built in the early 18th century, St. John’s Smith Square is an example of English Baroque architecture. But the real joy of the building is the acoustics that makes a building of its size seem so intimate. The building even appears in the film ‘An Education‘, where Carey Mulligan’s character heads there to see a classical concert. The types of concerts range from lunchtime concerts, chamber orchestras and Christmas carols performed by both seasoned veterans and young classical stars of the future. 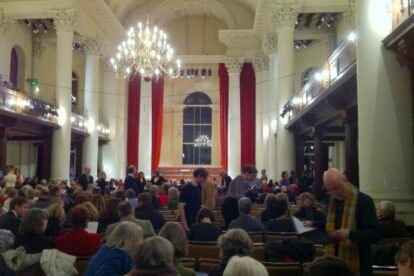 A night of classical music does not have to be expensive; it’s quite easy to get tickets for about £ 10. That’s less than 10% of what Royal Opera House tickets could cost! The Smith Square restaurant downstairs also provides quick meals before the concert and some wine and snacks during the interval (I can highly recommend the chocolate cakes).